South Korea's currency market has more or less stabilised and will gain further support as the government's stimulus measures take hold and foreign investors return, Han Seung-Soo, Prime Minister of Republic of Korea said on Jan. 30. The won fell 8.7 percent against the dollar in January as the foreign exchange authorities were hardly seen selling dollars to support the local unit. "The currency market is more or less stabilised already. Although the won has been depreciating over the last few months, I think the won has been more or less stabilised at the current level," Han Seung-soo told Reuters on the sidelines of the annual meeting of the World Economic Forum. "When the time comes and when our stimulus begins to work, I'm sure that more long-term foreign investors will come back. That will further stabilise our currency situation," he said. One of the more repeated comments heard in the after hours chatter in the salons of Davos was that no one from the financial industry has actually apologized for the mess they've created in the global financial system. 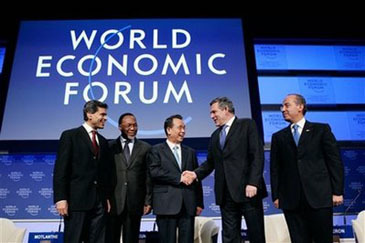 It is true that many of Wall Street's whipping-boys decided not to attend this year's World Economic Forum. Merrill's John Thain and Barclay president Robert Diamond, Jr. didn't show up for a session titled "Scenarios for the Future of the Global Financial System." Those bankers who did make an appearance argued we shouldn't play the blame game. As one put it with some bitterness: "What we call greed now, we called success a year ago." While not disposed to apologize openly, many financial titans were perfectly willing to air their ideas to fix Wall Street. In the session, Dan Och, CEO of Och-Ziff Capital Management, one of the few hedge fund managers to attend Davos, commented with not a little understatement that there's been "lots of disappointment in the industry." He believes, however, that "those hedge funds that before the crisis did risk management, practiced transparency and had strong institutional relationships will prosper." His implied message to the Obama administration: just leave us alone. Not everyone on the panel possessed such a laisse-faire attitude. Jean-Claude Trichet, president of the European Central Bank, argued that we need a global financial regulatory system, the details of which were too mind-boggling to explain in a panel discussion, but did involve heavy regulation of the derivatives market. Tony Tan Keng-Yam, the Executive Director of GIC, Singapore's sovereign wealth fund, said that in the future the financial world will be divided into two types of institutions. On one side will be big commercial banks with tight regulations, low leverage and government guarantees. On the other will be hedge funds and private equity firms - smaller businesses with higher leverage and less regulation. One key to making such a system work would be to attract top talent to police Wall Street. Keng-Yam suggested following Singapore's lead by paying U.S. regulators salaries competitive with the private sector. Kravis said what's really needed to fix Wall Street is to get rid of 'short-termism." The key is the compensation system. Wall Street executives currently get paid based on how their business performed in a single year, he explained. Instead, bonus pay should be determined by how well their decisions turn out four or five years down the road. Kravis: "We need to align the interest of shareholders and all interested parties - employees, NGOs, environmentalists and suppliers."